Laurie Faria Stolarz on Laurie Faria Stolarz: "I grew up in Salem, Massachusetts, attended Merrimack College, and received an MFA in Creative Writing from Emerson College in Boston. I am currently working on Deadly Little Secret, the first book in the Touch series (Hyperion, fall 2008), also for young adults." Visit Laurie's LJ and MySpace page! We last spoke in August 2006 in conjunction with the publication of Bleed (Hyperion, 2006). Could you update us on your writing life over the last year? I've been busying myself this past year with the marketing of Bleed, the editing of Project 17, and the writing of Deadly Little Secret--the first book in the Touch series, a new suspenseful series of books I'm working on. Congratulations on the release of Project 17 (Hyperion, 2007)! What was your initial inspiration for writing this novel? Thanks! I'm really excited about it. I wanted to do a companion book to Bleed, using one of my Bleed characters. Around the time I was thinking up ideas for a new project, the newspapers in my area were flooded with stories surrounding the controversial tear down of Danvers State Hospital, an abandoned mental hospital 30 minutes north of Boston. Many people were against tearing it down because it's considered an historical landmark, built in 1878. Developers wanted to use the land to build luxury apartments and condos. In the end, it's the developers who won, and two-thirds of the hospital was torn down. People are now living in the new developments. Growing up, the hospital, which has a very dark history, was finally shut down in 1992 due to budget cuts and overcrowding. Rumored to be haunted, it became a notorious hot spot for break-ins and dares. Coincidentally, in Bleed, one of my characters, Derik LaPointe, breaks in to the hospital to go exploring. This is how the initial idea for Project 17 sparked. I thought, why not have Derik break in with a group of teens, on the eve of the demolition, to spend the night and film a movie? There are six teens that break in--all with their own motivations and agendas, and what they end up finding is far beyond anything they could ever imagine. Once the story idea and sample pages were accepted by the publisher, I started to delve into the research--visiting the hospital, talking to former patients and staff, and reading and viewing everything I could get my hands on concerning the hospital. I got completely haunted by the research, so much so that I started keeping myself awake at night. I couldn't get it out of my mind, particularly after I visited the place from a writer's perspective--how was I going to write an entire novel that takes place here? The hospital itself had always been a source of scares growing up, with its Gothic spires and castle-like architecture, but nowhere near as scary as when I started to really get into the individual stories of those connected to the place. After a while, though, for better or for worse, I started to numb up a bit to everything I was researching, including hours of audio and visual footage. That numbness enabled me to take a step back and write the book. I don't scare easily, but there's some serious creepiness here. What advice do you have for writers seeking to scare spooky-story readers like me? Try writing about something that genuinely terrifies you. 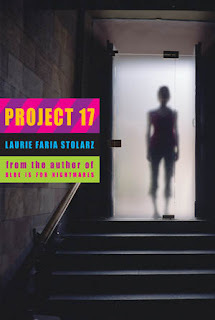 Project 17 is scary because I was scared--because I was so haunted writing it. As one of your regular readers, I would've been eager to grab your latest in any case. But after seeing your book trailer, I was especially intrigued. Could you share with us the story behind the trailer? Mike Dijital, an urban explorer, created it for me. He has a wide array of visual (and audio) footage of Danvers State that you can view (and play) from his website: www.dijitalphotography.com. The footage on the trailer is his, and it's all authentic, taken from Danvers State during one of his urban explorations. Mike was a great resource to me when I was writing the novel. The novel is a work of fiction, but I wanted to be as true as I possibly could to the setting, and that's where he stepped in. When I first approached him to ask questions about the premises, he told me I could ask him anything; he visited the place so often he'd know if an empty Coke can was turned over from one visit to the next. I am very self-disciplined. I have to be. I have a lot to balance with writing, marketing, and family. When I'm on deadline, I write ten pages per week with no exceptions. I also set time aside each week for marketing and business. It all needs to get done, after all. Because I have a family, I spend a lot of time working at night and during my kids' nap times. I'm busy, but I'm lucky. I have a lot to be grateful for. Deadly Little Secret, the first book in the Touch series is about a mysterious boy who has a very dark past and a very special power. Ben Carter, 17, has the ability to touch a person or object and sense something from him/it. Sometimes this touch power is a blessing; most of the time it's a curse, especially when he's unable to control it. The main character, Camelia Hammond, 16, falls for Ben--hard--despite his dangerous past and despite how much she also fears him. The novel is loaded with suspense, drama, romance, and mystery. Deadly Little Secret is slated for a fall 2008 release.